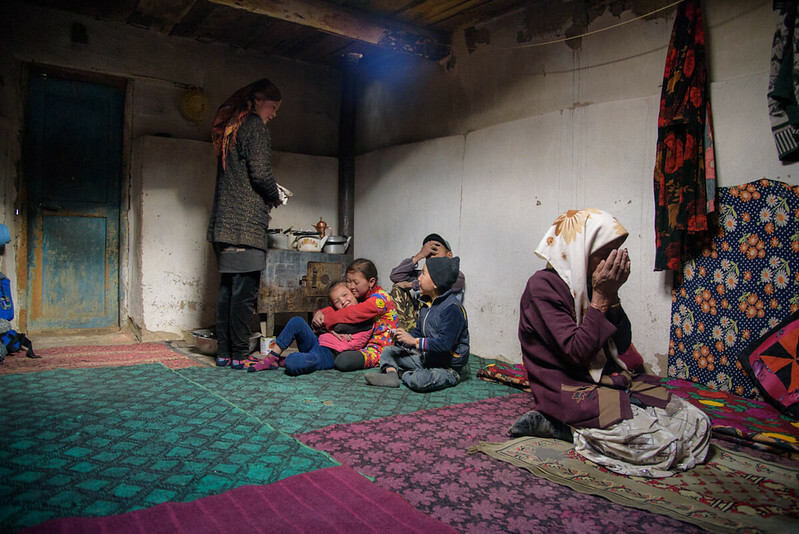 Today’s post is by Joan Torres, who is writing about the Pamir Mountains of Tajikistan. I was in Tajikistan in 2016 but I didn’t make it to the Pamir Mountains. I know several people who have visited, and from everything I’ve heard, it is an amazing place. At almost 5,000 meters (16400 feet) above sea level, we finally reached the Gumbezkul Pass, where we were blessed with a 360º view of the Pamir range, surrounded by tens of peaks, which I am pretty sure, they were all above 6,500 meters (21,000 feet). 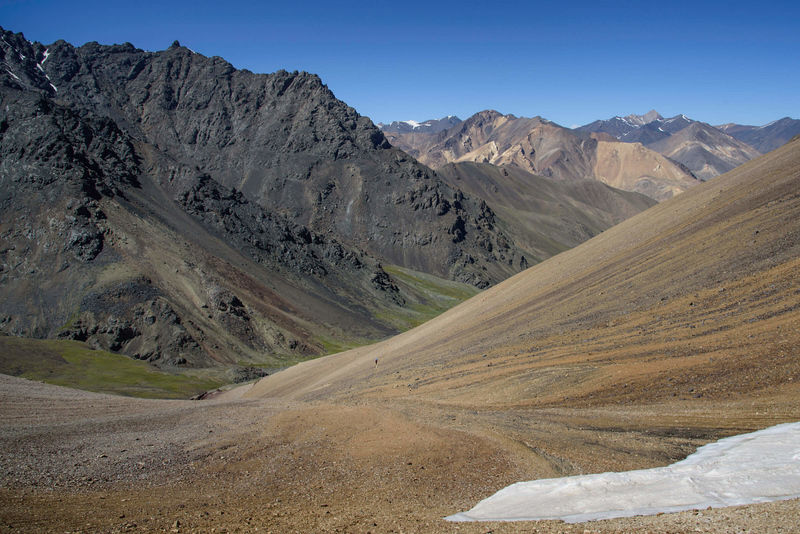 The Pamir range was like we had read in books: a deep feeling of remoteness, solitude and strikingly sharp mountains. The frozen wind was blowing extremely hard and we had not seen a single soul on the whole trek, besides the occasional nomadic camp and herds of Pamir yaks. There were no signs of vegetation and, at the end of August, all you could see were snow-capped, gray mountains. It was simply beautiful and not only because of all those gorgeous peaks but also, because of the strong symbolism which, for centuries, the Pamir Mountains have carried. Home to some of the most off the beaten track nomadic camps in Central Asia, these trails had been an important part of the Silk Road, which can be seen in the numerous fortresses and Buddha carvings in what is today a Muslim country. Trekking the Pamir plateau is the ultimate adventure and a destination only suitable for the most adventurous travelers. The Pamir Mountains extend across Afghanistan, Pakistan, China, Kyrgyzstan and, mainly, in Gorno-Badakhshan province in Tajikistan. Its highest peak is 7,649 meters above sea level, so this is the fourth highest mountain range in the world, after the Himalayas, the Karakorum, and the Hindu Kush. However, the harsh climate, inaccessibility and the fact that the country has only opened to tourism relatively recently, mean that they are some of the least explored mountains in the world. From Marco Polo to many important religious figures, the Pamirs are filled with thousands of years of history, witnessing countless historical events and civilizations who went along the historical Silk Road. Nevertheless, the footprints of the many empires are not the only events the Pamirs have witnessed. Thanks to the Soviet construction of the Pamir Highway, an architectural masterpiece which has become one of the greatest road trips in the world, in contemporary history, the Pamir plateau was the entry point of the Soviet invasion of Afghanistan in 1978, the region hosted thousands of refugees during the Tajikistan Civil War in 1992 and, nowadays, is the main channel for heroin coming into Europe from Afghanistan. Today, the Tajik Pamirs is a peaceful (but still remote) region, home to several ethnicities and cultures which mostly share one single religion, Ismailism, a kind of Muslim Shia, considered the most liberal branch in Islam. Despite being Muslims, their religious laws are more flexible so, combined with being an ex-Soviet country, even solo women won’t encounter any problems at all. I spent around three weeks hitchhiking, village-hopping and trekking around this region. My favorite part for trekking is, definitely, the eastern part, as it’s the remotest and where you find the highest mountains. 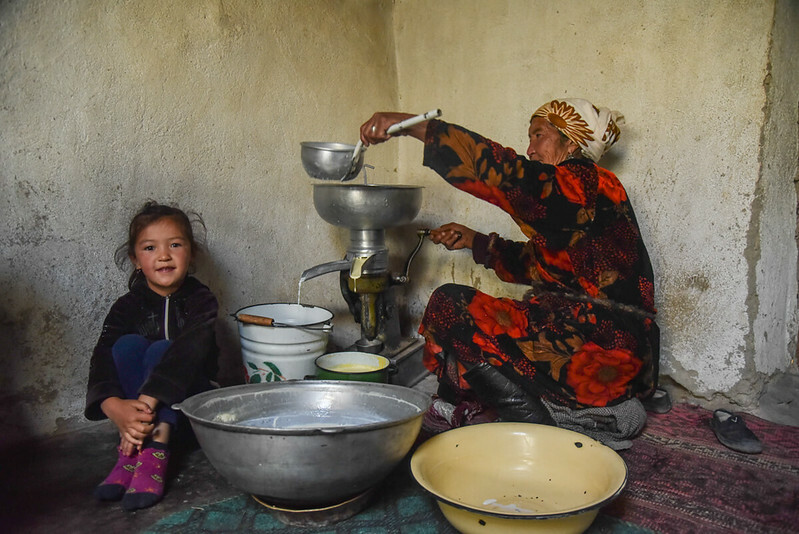 Despite being in Tajikistan, in this part of the Pamir range, most people are Kyrgyz, not different from the ones living in actual Kyrgyzstan. This means that trekking around this area involves staying in Kyrgyz nomadic camps inhabited by the most hospitable Kyrgyz I have ever encountered. In this article, I will explain how to trek from Pshart to Madyan Valley via Gumbezkul Pass, a trek which is easily accessible from Murghab and can be easily added to your Pamir Highway journey and itinerary. The Pshart Valley is a depression whose starting point begins from one side of the Pamir Highway. It’s a mostly arid valley where you find a few nomadic camps and from where you’ll start climbing the Gumbezkul Pass towards Madyan Valley. The beginning of the valley is a few kilometers away from Murghab and it can be reached on foot. Once you enter the valley, you will be walking over a dry plain which is surprisingly beautiful. At the end of the valley, you will find the nomadic camp from where you will cross to Madyan over the pass. By the way, if you wish, you can also reach this place by car or taxi. The very few travelers who do this trek tend to stay at the aforementioned yurt camp. It’s a nice place, way more authentic than most Kyrgyz camps found in Kyrgyzstan. However, if you want to stay in an even more genuine place, around 5 kilometers before (see map location) there is a small camp, one or two kilometers off the trail into the side of the valley. We saw it by chance and we decided to give it a try. What we found was an extremely hospitable nomadic family who opened their hearts to us and asked us to please stay. We helped them milk their yaks and, unlike most of the yurt camps which have spare yurts for foreigners, we actually slept in the same yurt with the family, as well as eating all our meals with them. It was a wonderful experience, very different from the ones we had in Song Kul, Tash Rabat and the Tien Shan mountains in Kyrgyzstan. On the following morning, they didn’t want our money but we managed to give them a tip. Very few foreigners have stayed in that camp, so I strongly recommend you go there. Start early in the morning, as you still have one or two hours to walk before reaching the main nomadic camp, the starting point of the climb. Going over the Gumbezkul Pass to Madyan Valley takes around 7 or 8 hours, depending on your level of fitness. Note that this is not an easy trek as the ascent is extremely steep and the descent is even harder, as it is steeper and the trail is full of tiny rocks, making it very slippery, hence dangerous. While descending, I quickly understood why the locals recommend not to do this trek the other way around. Once you are down, if your knees still allow you, you just have a 2-3-hours pleasant walk left until you reach the dreamy and fertile Madyan Valley. On the way, you will find another yurt camp where you can stay, but we decided to camp at Madyan. Unlike the dry Pshart, the Madyan Valley is composed of a lush, grassy meadow resting next to a beautiful blue-water swamp. Remember that there are no yurt camps here so, if you wish to stay, you will need your own camping gear. Otherwise, stay at the yurt a couple of kilometers before. Alternatively, at Madyan, there is a road following the valley until Murghab. However, we arrived there around 5 pm and we didn’t see any car passing by, so we had to wait until the next morning to hitch a ride. Once you pass the beautiful plain, the landscape turns very rocky and the lack of cool wind makes the walk slightly unpleasant. Your best bet is to hitch a ride, which we found after one hour of walking. Visa – Most Western nationalities can apply for a 45-day e-visa. The process is very simple and it takes a few days. You can apply for it here. Gorno-Badakhshan Autonomous Region – GBAO is the region located in the east of Tajikistan, where the Pamir Highway and Wakhan Valley are. The government considers it a sensitive area which means that you require a special permit. To get it, when you apply for the e-visa, you need to check the GBAO box. It’s that simple. Transportation – Some people, who don’t have much time, go to the main yurt camp in the Pshart Valley by car and then go over Gumbezkul Pass while a driver waits for them at the other side, in Madyan. If you are already on a tour, it won’t cost you anything but, if you are hiring a driver for the day, it can easily cost you around 150USD. 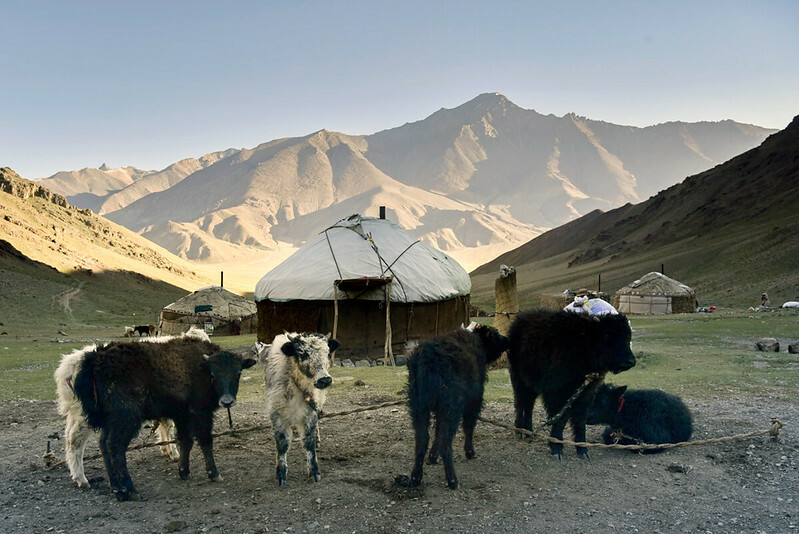 Staying at the yurts – In the Pamir region, typically, staying in a yurt costs around 15USD, with dinner and breakfast included. The only time I didn’t pay this was at the remote yurt camp I mentioned before. Camping gear – A tent and a sleeping bag are not mandatory, as you can stay in yurts. However, bringing good trekking boots and a warm jacket is a must. Bring loads of water for the first day – On the first day, I just bought a 1.5-liter bottle of water, as my GPS said we would cross a river somewhere in the middle of the way. Nevertheless, due to the extreme dry wind, we dehydrated very quickly and, when we finally got into the river, we realized that the water was gone, which is not at all surprising, given the arid landscape surrounding us. Bring at least 3 liters for the journey. When you arrive at the first yurt camp, you will be able to refill your bottle. I highly recommend bringing purifying tablets or a Steripen. High altitude – Murghab is already at 3,618 meters, which means that you could get altitude sickness at the starting point itself. If you are not used to this kind of altitudes, it’s recommended to stay in Murghab for at least two days, before going on a trek. Furthermore, remember to drink loads of liquids and, just in case, bring Diamox with you.